It has been a couple of days that a group of 12 Gorkhaland Janmukti Morcha supporters are on a hunger strike for indefinite times in Darjeeling district of West Bengal. It has been a couple of days that a group of 12 Gorkhaland Janmukti Morcha supporters are on a hunger strike for indefinite time in Darjeeling district of West Bengal. They are on the strike since July 21 and are not ready for a second thought on their demand for a separate state. The group of 12 agitators from youth wing of GJM is taking the matter further all over the district since early days of July. 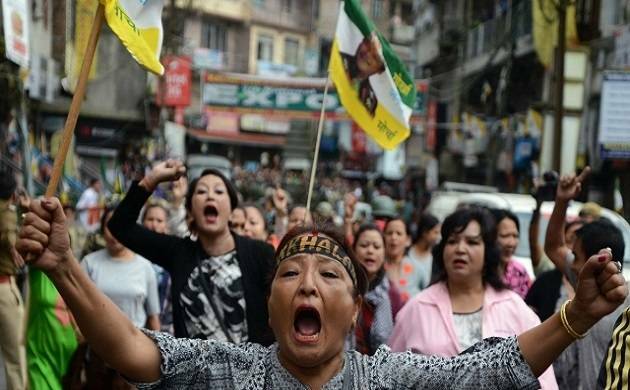 While some of them are on a fast till-death in Kalimpong, others are staging protest by a hunger strike since July 21 in several hill areas of West Bengal such as Darjeeling, Kurseong and Mirik. The entire process is been staged to create pressure on the Centre to make their demand accepted. Meanwhile West bengal Chief Minister Mamata Banerjee has advised all the agitators to take medical help as they are on hunger for long. The Mamata Banerjee government further warned that protestors who have denied to follow the same. The GJM supporters, denying to take an aid may also be booked for abetment to suicide and murder. In the mid of such tensed and horrible environment in the place, Darjeeling district magistrate Joyoshi Das Gupta on Friday issued a notice to the protestors which reads, "You are requested to kindly avail medical aid as will be advised by the medical officers. You are to inform us or persons around you in case you feel any weakness or dizziness." "All concerned may note as per Indian law, any person who directly or indirectly tries to prevent government authorities from providing medical assistance to persons on fast including removal to hospitals when required, may be liable for punishment for abetment to suicide and abetment to murder," the notice adds. You are requested to kindly monitor the health conditions of people on fast at Darjeeling, Kurseong and Mirik. Your personal intervention is requested to shift them to hospital," the notice to Darjeeling and Kalimpong legislators Amar Singh Rai and Rohit Sharma reads further. A couple of medical officers are also appointed in all the four districts to keep a tab whether the agitators are suffering illness and need any kind of medical help to be cured. "They have started the indefinite hunger strike on their own will. If they need medical assistance, they can do so at their own will. But the manner in which the administration made some communications today is unfortunate. The movement will continue until our demand is achieved," Prakash Gurung, Yuva Morcha president was quoted while talking about the notice. The indefinite strike which is on its 45th day has a huge impact on the schools, colleges, shops and several other daily activities of the. A feel of horror and panic is hugely disturbing the daily lives across Darjeeling and its suburbs.